Name, age, hometown: My name is Maggie Restivo. I am 18 years old and I live in Waterloo, Ill. (It's really close to St. Louis.). What corps are you in and what is your role this summer? : I am a member of Southwind's color guard. Where I go to school and what I'm studying: Right now I am at a community college (Southwestern Illinois College or SWIC) and studying theatre performance. Next fall I plan on attending Southern Illinois University of Edwardsville for the same thing. Give us your full drum corps/marching music background. : I marched all four years of high school with the WHS Marching Bulldogs in the color guard, two years of high school winter guard (We won state my senior year, what a great way to go out! ), and then this summer will be my third with Southwind. I also am one of the coaches of the high school color guard at Sparta, Ill.
What's your practice schedule like? : I try to practice everyday but because of work and school I don't always get the chance. On a good day I do a lot of dance and equipment basics a lot of running and a lot of crunches! Coaching helps keep me practicing too. What does your ideal free day consist of? : Wearing normal clothes, hanging out at a mall or walking the town and eating at least one ice cream cone. This past summer we had a free day in New York City. That was pretty awesome. Being the big theatre nerd that I am, I saw "The Producers" at the St. James Theater. I don't think any free day can get better than that! Favorite pig-out food: Ice cream cones! That, or the little pints of Ben and Jerry's. In the shower you can hear me singing: "I Will Survive," but I always take requests. The last good book I read: "The DaVinci Code" The last great film I saw: "The Upside of Anger" Jobs I have/have had: When I first turned 16, I worked at Arby's in Waterloo. After that I started working as a caterer for Super Smokers BBQ restaurant and worked there up until January. Now I wait tables at the local Applebee's. My favorite TV show: "Project Runway." It's on Bravo on Wednesday nights at 9 p.m. and then again at 10 p.m. If I have to work, I tape it! What has been your formative drum corps moment? : The Alton, Ill. show in 2004. It was the first summer I marched and it was the closest show to my hometown. Every year my high school band goes to that show. I can just remember walking off the field and seeing my parents and my sister and hearing all of my schoolmates cheering for me. It was the moment I thought to myself "I'm really doing this!" Watching and hearing the finals retreat for the first time and in person that year was pretty cool too. What would you be doing next summer if you were not marching? : Working a lot and maybe taking some class and coaching color guard. How did you decide to be a member of your corps? : My color guard coach knew a few guys (drummers) who were going down to Kentucky to audition and wanted to send me with them, however, I was unable to attend auditions due to a death in the family. I kept in touch with the caption head at the time and ended up filling a hole in late May of 2004. What first attracted you to the drum corps activity? : When I first started doing color guard in high school, I thought that it was just a high school/college activity. I had no idea that you could perform and compete at such a high level. I first saw drum corps on PBS by mistake. I was just flipping through channels and came across what I thought was a marching band at the time. The more I watched the more I thought "That's really good, that's really, really, good! Hey, I wanna do that!" All of the color guards were so fluid, and beautiful and intense. I'd never seen anything like it before. What advice would you give to young people who want to march? : Just go for it! Don't second guess yourself and don't be afraid to ask questions. It is going to be a lot of hard work, and you're going to wonder what the heck you're doing at some point, but it's worth it. Don't ever give up your dream! What I want to be when I "grow up": When I "grow up," I want to be an actress. Not a movie actress though, I love live performances way to much to give them up! I love the whole idea of creating a character and really getting into it. Playing villains is a lot of fun because you get to be the person everyone loves to hate! Just the whole idea of being so many different people in a lifetime is a really great one to me. 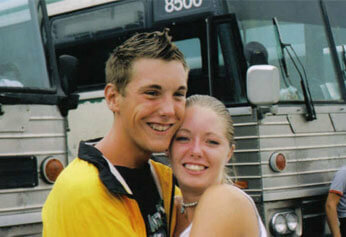 Favorite drum corps personality and why: One of my instructors, Robbie Arnold. He's such a one of a kind character. He has all these wacky facial expressions and a real Kentucky accent. Two of my fellow guard members, Megan F. Cook and Katrina "Flag Team Captain" sure rank right up there too! Best drum corps show ever and why: Oh wow, there are way too many to pick just one! It's like potato chips. One just doesn't do it for ya! The year is 2030. What does a DCI show look like? : I see a lot of throwbacks to old school uniforms, but with a modernized (whatever modern may be for the time) spin. As far as music, I think anything will go. I'm not a huge fan of the whole ampped singing shebang, but I think it can be/has been tastefully done before and hopefully that will be the case in 2030. Feel free to add anything else you'd like. 2006 is going to be a rockin' awesome year, and I can't wait for the start of the summer!